If you are already decided to give your business in the lease then, first of all, get a tenant who is reliable and can run the business properly. A business Lease Agreement should be clear between the lessee and the tenants as it gets handover to the new owner for long terms basis or short term basis. 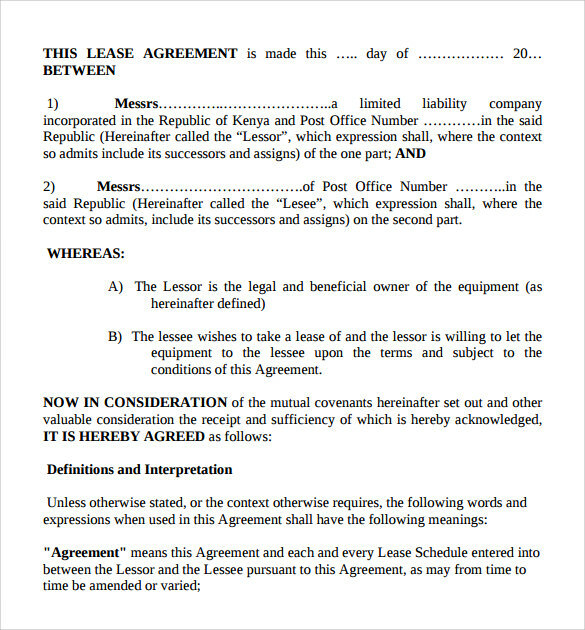 This lease agreement is made between the tenant and the landlord regarding a property to be used for business premises. This lease will contain the definition of all the terms used for property and amenities that are to be leased to the tenant to make clear on the exact amenities being leased. The lease will also consist of the intent of the lease and directions regarding use and occupation along with distress measures and overholding consequences. This agreement will also contain terms of expected behavior that is to be conducted by tenants and all tenants must adhere to those rules. 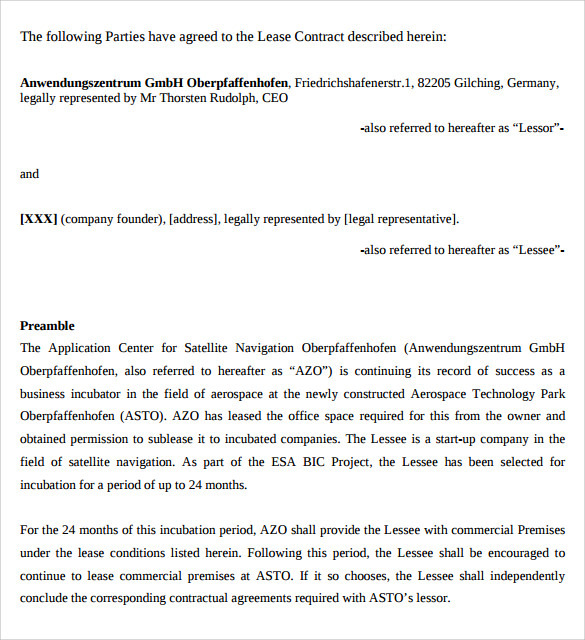 A master equipment lease agreement is created when the leasee needs to lease equipment from the lessor. The leasee is supposed to create a schedule that consists of all the equipment the lessor requires. This schedule consists of individual agreements for each equipment which explains that this schedule is nothing but a list of all individual agreements for every equipment. This lease will consist of all the leasing criteria instructions such as the maintenance of the equipment and risk assessment that need to be followed. Here the tenant has to pay the base monthly rent including other expenses and the add-on increases to this come from actual costs rather than expenses. When the landlord incurs an increase in the cost the rent increases accordingly. In most net lease agreements the tenant pays the monthly rent along with the proportionate real estate tax. In a net lease agreement for real estate the tenant has no lee way when it comes to the raising of rent. If the rent is raised, the raised rent needs to be paid as it is completely up to the landlord’s discretion. Why Do We Need Business Leases? A business lease is a legally binding written contract between the lessor and the lease with terms negotiated on the lease. Both parties are required to adhere to the terms provided on the contract, the failure for which can be binding against legal action. Why Is An Oral Agreement Not Sufficient? The issue with oral agreements is that they are not easily enforceable. If a dispute should occur the court will have to listen to the cases from both parties and decide on whose story to believe. This could go either way and could go very wrong for either party. Hence it’s always safer and economical to go for a written legal agreement. You can also see Rental Lease Agreements. Who Are The Parties In A Lease? The parties in a lease are the lessor and the lease. The lessor is the owner of whatever is the object of the lease and the lease is the one who’s renting it. What Is The Governing Law Of The Lease? The governing law of the lease is the legal authority over the area where the property is located regardless of the addresses of the lessor or the leasee. Most types of business lease agreement are available here in both Word and PDF formats. 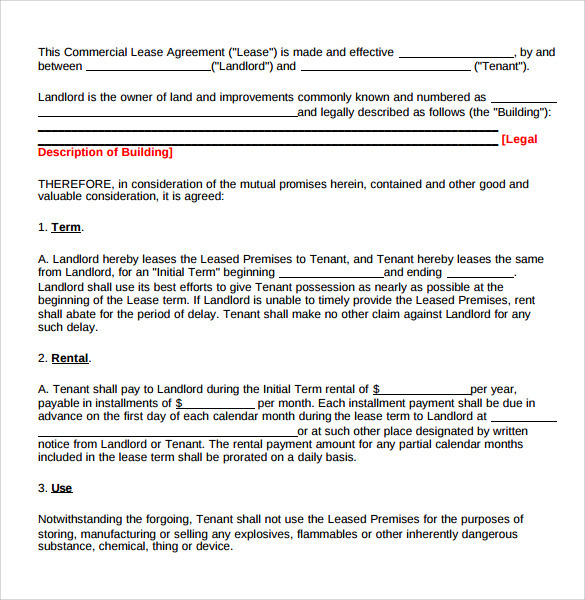 These templates can be used to create the format for actual business lease agreements. If the format needs editing, these templates are easily customizable and are perfectly compatible with most operating systems. The templates provided are very formal and the corresponding themes are easily convertible into legal documents. These leases will help in create the perfect legal document for all business lease purposes.You can also see Commercial Lease Agreements. 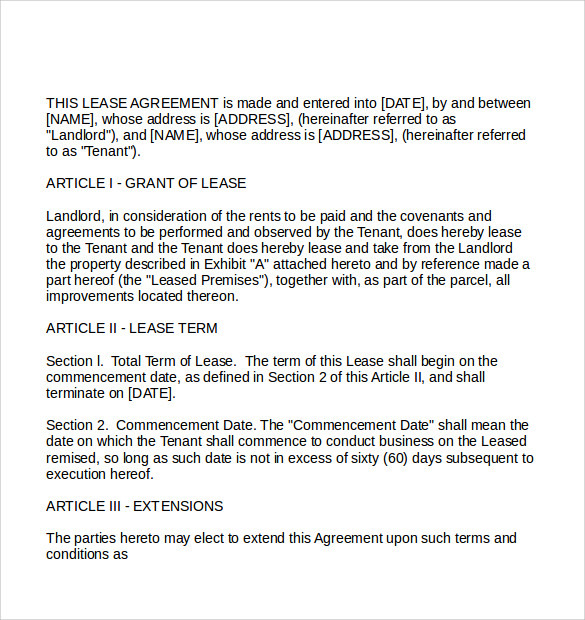 All the templates regarding business Lease Agreement are finely designed by our template artist who provides more uniqueness with legal clauses to catch the attraction of your tenants on your business.You can have a business lease agreement template in PSD, PDF, MS word and other formats.